1. Sarah Needs. "The Biochemical Basis of Congenital Disorders of Glycosylation." The Open University. 2019. 3.Xue H, Yuan G, Guo X, et al. "A Novel Tumor-promoting Mechanism of IL6 and the Therapeutic Efficacy of Tocilizumab: Hypoxia-induced IL6 Is a Potent Autophagy Initiator in Glioblastoma via the p-STAT3-MIR155-3p-CREBRF Pathway[J]." Autophagy, 10 May 2016. 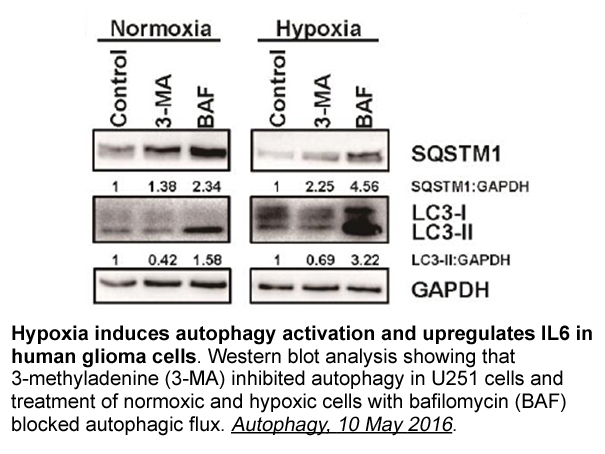 In Western blot assay, we test whether Wortmannin and 3-Me could inhibit the effect of autophagy in 3T3 cells. The 1mM of inhibitors can suppress the cell survival of 3T3 cells. Due to the death of cell at the high concentration of Wortmannin and 3-Me, they are not fit to test in Western blot assay. 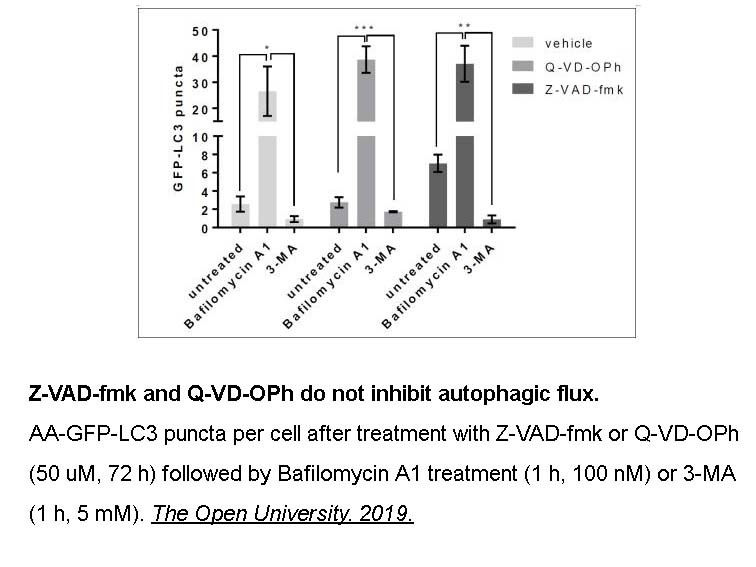 The result has been shown that the low concentration of Wortmannin and 3-Me (1μM) significantly enhanced the P62 and inhibited the level of autophagy in 3T3 cells. Method:Western blot; Cell Lines:3T3 cell lines; Concentrations:1μM～1mM; Incubation Time:24 h.
Description 3-Methyladenine is a selective inhibitor of PI3K with an IC50 values of 25 μM and 60 μM for Vps34 and PI3Kγ, respectively. The solubility of this compound in DMSO is >10 mM. General tips for obtaining a higher concentration: Please warm the tube at 37 °C for 10 minutes and/or shake it in the ultrasonic bath for a while. Stock solution can be stored below - 20 °C for several months. 3-Methyladenine (3-MA) (5 ~ 10 mM) strongly inhibited HT1080 cell migration. In addition, 10 mM 3-MA showed a stronger effect on the suppression of HT1080 cell migration than both 100 nM WMN and 25 μM LY294002.
. Ito S, Koshikawa N, Mochizuki S, et al. 3-Methyladenine suppresses cell migration and invasion of HT1080 fibrosarcoma cells through inhibiting phosphoinositide 3-kinases independently of autophagy inhibition. International journal of oncology, 2007, 31(2): 261-268. 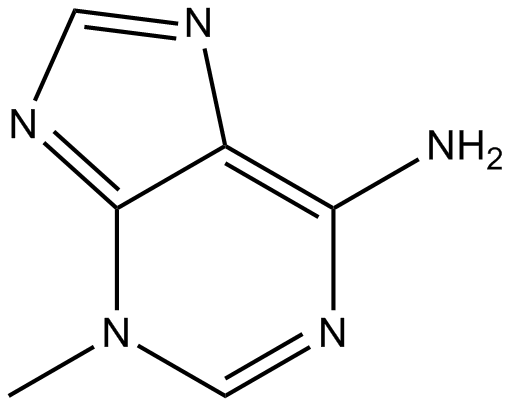 3-Methyladenine is an inhibitor of class III phosphoinositide 3-kinase (PI3K) . 3-Methyladenine is widely used as an autophagy inhibitor through inhibiting class III PI3K without significantly affecting protein synthesis or ATP levels. 3-Methyladenine also inhibits class I PI3K. It is found that 3-Methyladenine has different effects on class I and class III PI3K. It blocks class I PI3K persistently while inhibits class III PI3K transiently. As an inhibitor of autophagy, 3-Methyladenine is usually used to study the role of autophagy. In addition, 3-Methyladenine is also found to have anti-cancer efficacy. It induces cell death of tumor under nutrient-starved conditions. 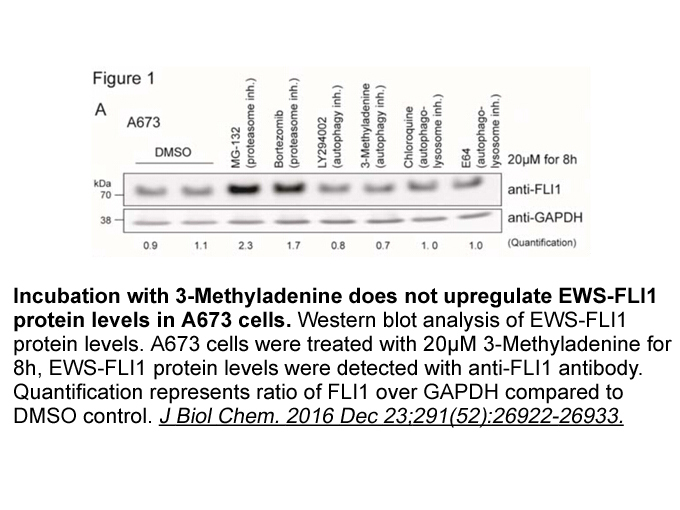 In HT1080 cells, 3-Methyladenine significantly inhibits cell migration through reducing membrane ruffle and lamellipodia formation in normal culture condition. It also inhibits the invasion of HT1080 cells [1, 2]. Wu Y T, Tan H L, Shui G, et al. Dual role of 3-methyladenine in modulation of autophagy via different temporal patterns of inhibition on class I and III phosphoinositide 3-kinase. Journal of Biological Chemistry, 2010, 285(14): 10850-10861. Ito S, Koshikawa N, Mochizuki S, et al. 3-Methyladenine suppresses cell migration and invasion of HT1080 fibrosarcoma cells through inhibiting phosphoinositide 3-kinases independently of autophagy inhibition. International journal of oncology, 2007, 31(2): 261-268.